You should know all these parameters to reconstuct RAID 6 successfully. Our software ReclaiMe Free RAID Recovery (download) can recover RAID6 configuration automatically. See the step-by-step RAID Recovery instructions. 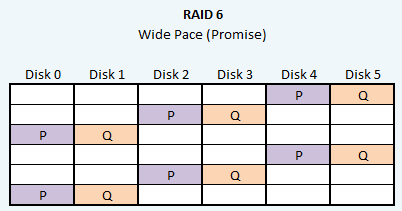 RAID 6 is significantly more complex than RAID 5. The first parity function (XOR, denoted as P on the diagrams) naturally comes from RAID5. However, there is no widely accepted standard for the second parity function (Q). Typically, a Reed-Solomon code or some variation thereof is used. Reed-Solomon code depends on the order in which input is provided. This produces four more variations: left-to-right or right-to-left and if P or Q is calculated first. There are several variations of layout accomodating two parity functions. Although RAID 6 should be recoverable with one or two disks missing, the implementation of ReclaiMe Free RAID Recovery cannot work with RAID6 having missing disks.